1. First of all, can you tell me where the idea came from for Dark City? The idea for Dark City hit me like a ton of bricks and knocked me right off my feet. The night the idea came to me, I stayed up until 3 in the morning frantically typing away. I lived and breathed the story for years. 2. Your book is obviously set in a city. How important is a sense of place to you in your writing? A sense of place is very important to Dark City. I wanted the city to take on a life of its own, to become a character in the novel rather than just a backdrop. I’ve drawn maps of the city and written detailed descriptions of all the different districts, as well as foraying into some history that you’ll learn more about in the sequel. 3. Can you tell me more about how you became a writer? If you weren’t a writer what do you think you would be doing now? I became a writer mostly because it’s the one thing I’m good at. I love to read, so writing my own novel seemed like the natural choice. 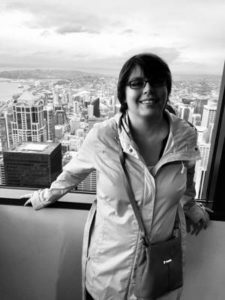 I’ve also worked as a freelance writer and currently work as a grantwriter for a non-profit. If I wasn’t a writer, I’d probably be a researcher at a university somewhere studying psychopathology. 4. Do you plot your stories meticulously or do you just write and see where it takes you? I don’t plot meticulously, though I’ve tried. I really just have to write things out and see where they take me. I struggle to make outlines. I need to be in the thick of the story, sketching out the full scene, in order to see the possibilities. 5. Could you tell me about your writing day? Where do you write and do you have a daily routine? On days that I work at my “day job” I sit down to write at about 7am and put in an hour at my desk in my library before I go in to work. On weekends and my off days, I start a little later, but I always write first thing in the morning. After that, I just try to find time whenever I can during the day. Often I go to nearby coffee shops for a change of pace. 6. I see from your website that you have a large to be read pile (welcome to the club!). What kind of books do you like and if you could recommend just one book what would it be? I read almost everything, from comic books and romances to literary fiction and noir. It’s really hard for me to recommend just one book because people have such varied tastes! If you like deep, emotionally resonant literary fiction, I recommend my all time favorite book, A Little Life by Hanya Yanagihara. If you love fantasy and adventure, I recommend The Name of the Wind by Patrick Rothfuss. 7. Do you have any interesting writing quirks? In talking to other writers, I have learned that the way I write is somewhat unusual. I can’t write in order; I don’t start at page one and make my way down the story. I jump around to whichever scene catches my eye first. And instead of refining and revising a first draft, I usually have a rough first draft, and then I start over on a fresh blank piece of paper once I know the characters a little better. And then I wipe the slate clean and start over again. Dark City was started over like this four times before it was finished. 8. What are you planning to write next and where will it take us? 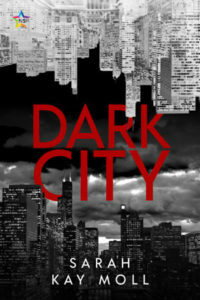 Right now I’m plotting the next three books in the series, so we’ll be staying in the dark city, for the most part. Ras, Ash, and Scarlett will resume their adventures, and we’ll meet a new character: Nate Redfield. If Ras is the villain of this story, you could think of Nate as the hero. Thanks so much, Sarah. I do have A Little Life but I haven’t got round to tackling it yet. I love the way the idea for your book just hit you like that and I’m fascinated by what you think you would be doing if you weren’t a writer. Sarah Kay Moll is a wordsmith and an amateur homemaker. She’s good with metaphors and bad with coffee stains, both of which result from a writing habit she hasn’t been able to quit. She lives a mostly solitary life, and as a result, might never say the right thing at parties. She’s passionate about books, and has about five hundred on her to-read pile. When she does go out, it’s probably to the library, the theater, or the non-profit where she works.